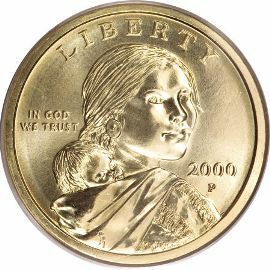 The Sacagawea dollar coin began its production at the US Mint in 2000. It is the Mint's second attempt at replacing paper dollars. 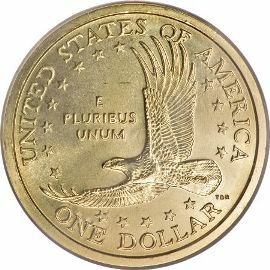 This coin was nicknamed the "Golden Dollar" due to its color when it is first minted. However, when they enter circulation the coins quickly tarnish. no actual photos are known, the face on the coin was modeled on a modern Shoshone-Bannock woman named Randy'L He-dow Teton. "E PLURIBUS UNUM" is positioned to the left of the eagle. bonded to a pure copper core.